for the delay is a change in engine layout that occurred during the cars development process. 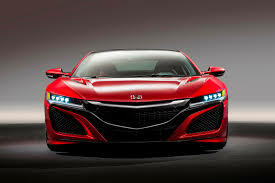 A spokesman for Honda confirmed that the delay to the Acura will also affect the European NSX saying With Acura announcing the delay of the NSX that will affect mass production of the Honda version] for Europe as it all comes from the same factory. It will be spring 2016 but there is no definite date yet. More information is expected later in 2015 most likely around October time. The European version of the Honda NSX was revealed for the first time at the 2015 Geneva motor show while the car was originally shown at the Detroit show in January some 25 years after the launch of its iconic predecessor. The new secondgeneration car has been developed in the US and will be produced in the new Performance Manufacturing Centre in Marysville Ohio. The heart of the NSXs powertrain is a 75degree twinturbocharged V6 which drives an all new ninespeed dualclutch automatic gearbox. On top of this the NSXs sport hybrid system incorporates three electric motors. Honda hasnt officially revealed the powertrains power and torque outputs yet but it is expected to produce a system total of about 550bhp. The V6 has a drysump lubrication system and compact valvetrain designed to allow the motor to be mounted as low as possible in the body helping to lower the cars centre of gravity. Honda says the ninespeed DCT is capable of synapsequick shifts and executes revmatching downshifts. One of the three electric motors is housed between the engine and gearbox and is said to support acceleration braking and transmission shifting performance. The other two motors are mounted on the NSXs front axle. Each motor drives an individual wheel not only delivering instantaneous torque according to Honda but also providing dynamic torque vectoring. Each motor drives a front wheel and can apply differing levels of torque enhancing acceleration and braking performance. This setup can also deliver zerodelay launch and braking performance the company says. Agile Handling Assist (AHA) uses subtle application of brake torque to further enhance response and dynamic stability. The NSX has four switchable chassis modes. Quiet mode allows the car to be driven on battery power only for short distances. The other modes in an ascending order of dynamism are Sport Sport+ and Track. Honda claims the latter reveals the full spectrum of the NSXs capabilities. During the NSXs development chief engineer Ted Klaus told Autocar that the complex electronics would be tuned to only intervene if they improve the driving experience. In particular he highlighted the possibility of using the electric motors to deliver instant throttle response or to allow silent allelectric drive. The NSX must stay true to the role it created of being an everyday exotic said Klaus. That means we must only use the new tech to support the driver to live with the car every day and to give the driver a car with a depth of abilities that they can peel away with familiarity as they get to know the car. The technology gives us a chance to create a car that is focused on being agile precise and linear in its responses like never before. We are looking to do more than chase numbers on paper as with the original NSX we wont have the most powerful car in the category for instance but we believe the human element is more important than that. Whatever we do the driver must be at the centre of the experience not the car. The structure of the new NSX is described as a spaceframe design that is constructed from ultrahighstrength steel and aluminium. The floor of the structure is made of carbon fibre and the cabin features ultrathin Apillars. The NSX also features a worldfirst (aluminium) casting process that combines the benefits of both cast and forged components. The body panels are made from a combination of aluminum and sheet moulding composite. At 4470mm long the NSX is about 40mm longer the original as well as 130mm wider and 45mm higher. The front track is a significant 145mm wider and the rear track 75mm wider. The cars shape was aerodynamically refined in Hondas Ohio wind tunnel. Under the skin the NSXs Tshaped battery pack is mounted down the cars centre tunnel and behind the seats. Suspension is by aluminium double wishbones all round and the car rolls on 8.5x19in front and 11x20in rear wheels. of the 458 at the price of the 911 and we think the hybrid technology can help us achieve that he said. The NSX has never been about a set of figures on a piece of paper he added. As with the original the eventual power figure wont grab headlines for instance but the qualities that you cant write down such as driver involvement and pleasure are the ones that will matter. As engineers we like numbers but Im acutely aware that if we build this car against a set of criteria that has been written down we will lose our sense of focus. The order books for the new NSX will open in the summer and the first examples should be delivered towards the end of this year. The likely price has yet to be revealed although the UK allocation of cars has already been reserved by eager customers. Officials have confirmed to Autocar that a righthand drive version of the NSX will be made with the aim to have that model on sale before the end of 2015. Just 1419 examples of the original NSX were sold in Europe between 19902007 from 18700 sales globally. Sources have already suggested that a Honda NSX convertible will likely be made. 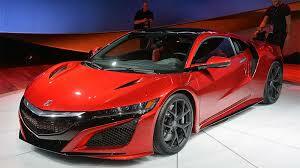 Hondas president Takanobu Ito has also hinted a racing NSX will be made. Speaking at the launch of the original concept car at the Detroit motor show in 2012 he said It is a car that is up to the performance of racing and while this car is for customers you might see it racing as well. Since 2005 we have strived to make a successor but global change has had a colossal effect on the industry in that time. Even a supercar must respond to environmental responsibility. This car is about high performance through efficiency. 0 Response to "Honda NSX 2015"